As a Process Engineer at AVX Tantalum, I worked on the Wet Tantalum Capacitor line. Wet capacitors are so named because the electrolyte is liquid – acid, in fact. A capacitor carries its charge in a conductive material between two metal plates. 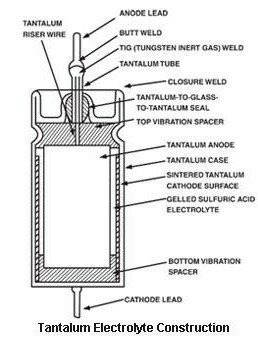 In Wets, the two plates are made of the metal tantalum and are connected by an acid electrolyte. In contrast, solid capacitors, which are found on any computer or cell phone circuit board, are completely solid; the two plates of the capacitor are tantalum metal, but are connected by solid tantalum oxide instead of acid. Wet capacitors are an older technology and are much, much larger than capacitors found in handheld electronics. They are still around because, by nature of their construction, “Wets” are quite rugged and can carry extremely high capacitance. They can be used in demanding applications, like satellites. 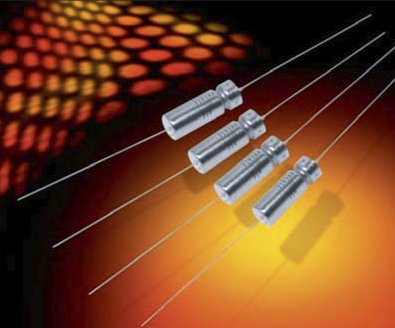 The products I worked on are meant to withstand temperatures up to 200˚ Celsius.